Station to display: select the station to display in this widget. Note that you can display as many Solar widgets as you want, so it is possible to display all the stations you have access to by arranging several widgets in one or several sidebars. Display X (if available): check all types of values you wish to have displayed. Hide obsolete measurements: check this to hide all measurements that was done before the obsolescence set in Settings > Display. Displayed name: set the name which will appear in the header of the widget. Subtitle to display: set the subtitle that will be displayed under the displayed name. Max width (in px): indicate the maximum width in pixel for the widget. Set 0 to ignore this parameter. Text & Background colors: using the color picker, set the values of these colors. Transparence of background: adjust the transparency of the background color. 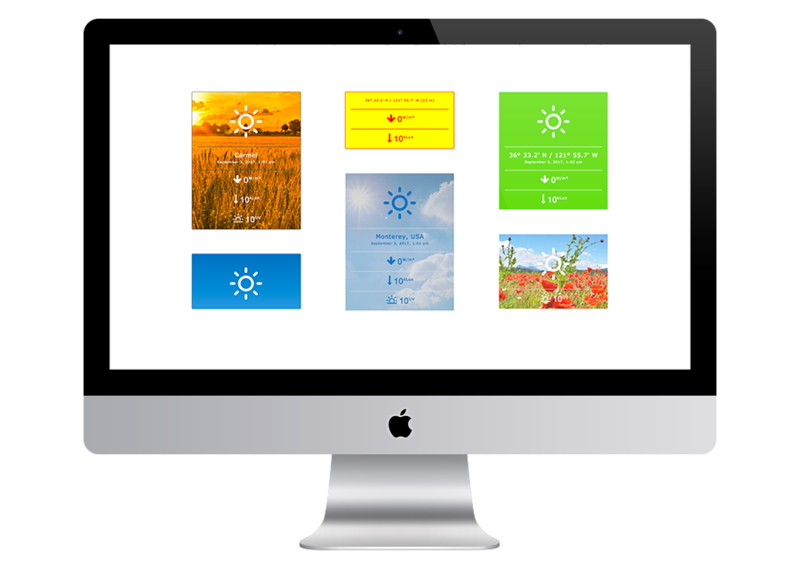 Images URL: allows you to specify which image to use as widget background. It must be a full URL (i.e. not a relative URL). If the widget displays a BloomSky station, you can specify “self” (in lower cases) to have the last snapshot taken by the station as background image. Fixed background: the background image will not scroll when the page is scrolled. Luminosity follows current light: if you have set a background transparency smaller than 100%, the brightness of the background color will change depending on the time of day. Show borders: activate this if you want the borders of the widget to be visible. Show tooltips: activate this if you want the mouse cursor hovering on the widget shows a tooltip. Flat design: activate this if you don’t want gradient background and shadowed texts.